‘Pink Poppet’ is a dwarf, dense, rounded, deciduous shrub that typically grows to only 2’ tall and spreads to 2-3’ wide. 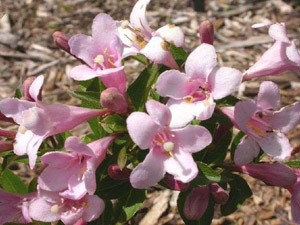 It is the product of a breeding program that took place in the Czech Republic during the late 1980s wherein Weigela florida ‘Venusta’ (seed parent) was crossed with Weigela ‘Eva Rathke’ (pollen parent). ‘Pink Poppet’ was selected in 1991 as a shrub noted for its dwarf growth habit, early-blooming pink flowers and winter hardiness. Funnel-shaped, light pink flowers (each to 1.25” long) bloom profusely in late spring, with a sparse and scattered repeat bloom often occurring in mid to late summer. Elliptic to obovate, dark green leaves (to 3” long) with serrate margins retain good color throughout the growing season. Insignificant fall color. Fruit is inconspicuous. Copyright © 2004- Marshall Trees & Nursery All Rights Reserved Hosting and Development provided by TakeCareOfMyWebSite.com.